Every Ramadan season, without fail, I get a steady stream of questions from my Hausa-speaking readers wanting to know the English lexical or idiomatic equivalent to “sannu da shan ruwa” or “barka da shan ruwa,” the special greeting for people who are observing the Ramadan fast. I always respond that English has no equivalent literal or idiomatic expression for it. I will reproduce and expand on the responses I’ve traditionally given over the years. Many expressions are simply untranslatable into other languages because of the vastness of the socio-cultural differences between the languages. The Hausa “Sannu da shan ruwa,” the Yoruba “eku ongbe,” or the Baatonum “bese ka noru,” which, as I will show shortly, all signify the same thing, is one such expression. (I will write a full-length column next week on Nigerian expressions that are untranslatable into English). A literal translation of sannu da shan ruwa (which would be, “greetings on drinking water”) makes absolutely no grammatical or cultural sense in English. Even a proximate idiomatic translation of the expression in English is impossible because the Ramadan fast isn’t integral to the culture of native English speakers. Cultures only lexicalize socio-cultural experiences that they undergo firsthand, on a large scale, and on a consistent basis. So if I were to meet a native English speaker who is a Muslim and I need to greet him or her to celebrate the mood of the month of Ramadan, I would simply say, "sannu da shan ruwa.” If I want to be linguistically nationalistic, I would say “bese ka noru,” which is the literal and idiomatic Baatonum (or Baruba) equivalent to the Hausa sannu da shan ruwa. I will then explain what the expression means instead of trying to get an English equivalent for it, because it doesn't exist. 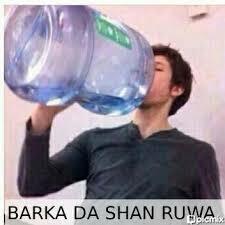 Yoruba Muslims say “eku ongbe,” which literally means, “greetings on thirst.” (“Ongbe” means thirst. So does the Baatonum word “noru.”) Apparently, Nigerian Muslims perceive deprivation from drinking water, not food, as the central self-denial in the Ramadan fast. Another example of a direct translation from another language that has become idiomatic in English is the phrase “enjoy!” often uttered in (American) airlines and restaurants after people are served a meal. It’s an attempt to translate the French “bon appetit,” which would literally translate as “good appetite” in English, but which actually means “enjoy your meal.” It’s a unique French sociolinguistic quiddity that English speakers now have a need to mimic because of recent French cultural and gastronomic influences. Outside of the grace (a short prayer of thanks before a meal) in religious homes, native English speakers don’t traditionally utter any special greetings before meals, like we don’t in Nigeria. Nevertheless, it might help to know that English-speaking American and British Muslims usually say “happy iftar,” or “wish you a joyous iftar,” during the feast after fast. Collins Dictionary says the first recorded usage of “iftar” in English dates back to 1722. Interestingly, the expression didn’t come to English directly from Arabic; it came from Ottoman Turkish, according to the Oxford English Dictionary. Thomas Jefferson, America’s third president, is the first American president to host an iftar dinner in the White House on December 9, 1805. He hosted it in honor of Sidi Soliman Mellimelli, the Tunisian ambassador to the United States at the time. In contemporary times, “iftar” reemerged in American English lexicon after former First Lady Hillary Clinton reintroduced and instituted the annual White House Iftar Dinner in 1996. During the dinners, she her husband, and other American officials often said “Happy iftar”—or some version of that expression— to American Muslims. George Bush and Barack Obama continued the tradition throughout their presidencies, but Donald Trump has stopped it. But “happy iftar,” “enjoy your iftar,” “wish you a joyous iftar,” etc. are all woefully incapable of encapsulating or even approximating the deep cultural, sociolinguistic signification of “sannu da shan ruwa” in Hausa, bese ka noru in Baatonum, or eku ongbe in Yoruba. For one, iftar literally means, “break fast.” It comes from the Semitic root word “ptr” (rendered in Arabic as “fatara” or “fitr” since Arabic has no “p” sound), which denotes breaking, splitting, detaching, or separating. While the Arabic iftar comes from a metaphor of breaking, Nigerian languages deploy the metaphor of water in their everyday cultural salutations during the Ramadan fast. Second, “iftar” refers to the meal after the Ramadan fast, for which Nigerian languages have lexical equivalents. For instance, Hausa speakers refer to the act of breaking one’s fast as “bude baki,” which literally means “open mouth.” Baatonum speakers say “no kora,” which literally means, “break mouth.” Yoruba speakers say “sinu,” a contraction of “si enu,” which literally means, “open mouth.” So Nigerian languages use the imagery of opening or breaking the “mouth” to express the act of eating after the Ramadan fast. The Ramadan-specific greetings in Nigerian languages aren’t limited to celebrating the end of the daily fast with a feast; they are intended to acknowledge the spirit of communal gaiety and joyful self-denial of the Ramadan fast. The closest socio-linguistic approximations to sannu da shan ruwa in Hausa, bese ka noru in Baatonum, or eku ongbe in Yoruba, in my opinion, are Ramadan Kareem and Ramadan Mubarak. Ramadan Kareem roughly translates as, “have a generous Ramadan” and “Ramadan Mubarak” roughly translates as, “greetings on the blessed Ramadan.” (“Kareem” means “generous” and “Mubarak” means “blessed”). Although they are Arabic expressions, they are widely understood in the English-speaking world and have entries in all major dictionaries.